It was match that seemed too could to be true. The Colts were looking for a receiver that could stretch the field and Donnie Avery wanted a fresh start to showcase his speed that made him the first receiver chosen in the 2008 NFL Draft. That combination turned into a free agent signing for Avery and the Colts. Avery said the dedication by the Colts staff outweighed his other four suitors in ultimately deciding on Indianapolis. “Chuck (Pagano), the head coach, he called me about four or five times and told me how he could get me back to my early years in the NFL, how I can look up to Reggie Wayne and the rest of the guys and how I can fit in the offense,” Avery said. Avery entered the NFL in 2008 and caught a total of 100 passes in his first two seasons with the St. Louis Rams. A preseason knee injury would sideline him for the entire 2010 season and Avery then played in eight games for the Tennessee Titans last season. In getting back that speed, Avery worked with Olympic Track Coach Allan Powell during last season’s lockout and has seen the benefits. One of the many reasons that sold Avery on playing in Indianapolis was a chance to learn from one of the franchise all-time leading receivers Reggie Wayne. Avery, although not the most vocal person, said he won’t bother Wayne too much for advice but you can be assured he will be paying close to the Pro Bowl receiver’s every move. With new faces across the board on the Colts offense, Avery said he feels as though everyone will be on the same page as he looks to get back to the player he was in St. Louis. It has been a whirlwind past 10 days for quarterback Drew Stanton. 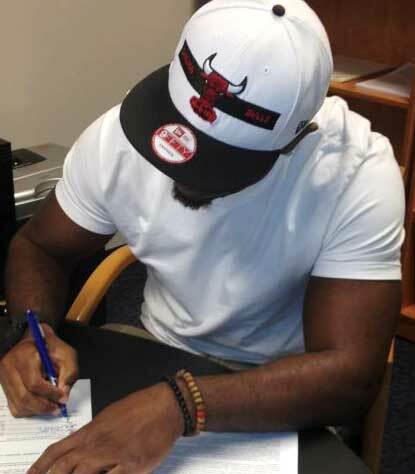 After singing with the New York Jets on March 16 and believing his new home would be in the AFC East, Stanton has now found a new home in Indianapolis when the Colts traded for the former Michigan State quarterback on Friday. Stanton spent his first five seasons in the NFL with the Detroit Lions but after an interesting past few weeks he is starting to settle into being in Indianapolis. The dominos fell to Indianapolis for Stanton and he heads into a team with many new faces moving into the 2012 season. At 6-foot-3-inches and 230 pounds, Stanton has the physical tools that helped him become a second round draft pick by the Lions back in 2007. He has started four games in his NFL career including winning his final two starts in 2010. One particular aspect of the Colts organization that Stanton is looking to forward to working with is his new offensive coordinator Bruce Arians. Since 2007, Arians has been the offensive coordinator with the Pittsburgh Steelers but now he has made the switch to the Colts and that is something that intrigues Stanton. For right now Stanton joins Trevor Vittatoe as the only Colts quarterbacks on the roster and Stanton knows that no matter what happens between now and the start of the season he has to practice as the starter. As the Colts have welcomed new faces to their defense in the past few weeks, one staple will be back in the fold next season. Colts general manager Ryan Grigson said on Monday that seven-time Pro Bowl defensive end Dwight Freeney will be back in the horseshoe. 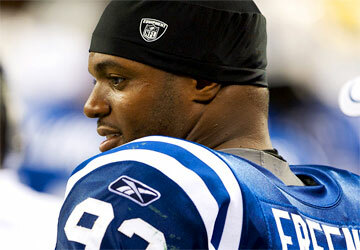 This past season Freeney cracked the 100-career sack plateau in earning his fourth straight Pro Bowl appearance. It remains to be seen how No. 93 will fit into the new Colts defensive scheme but there is no doubt where he will be playing football come September. The Colts added former Baltimore Ravens defensive end Cory Redding on March 14th giving them some more pieces among the defensive line. With Redding in the mix, the Colts have another end to go with a pair of returning Pro Bowlers that have wreaked havoc for opposing Indianapolis quarterbacks during the past nine seasons. The Colts have been extremely busy this off-season addressing the offensive line with three additions in the past month. Moving out to the skill positions, the Colts signed speedy wide receiver Donnie Avery on Friday to add to their offensive influx. The 5-foot-11-inch Avery spent his first three seasons in the NFL with the St. Louis Rams before playing for the Tennessee Titans last year. He was the first wide receiver taken in the 2008 NFL Draft and caught 100 passes in his first two seasons with the Rams. That speed will compliment a Colts receiving corps that returns veteran wide receiver Reggie Wayne and Austin Collie, who caught 54 passes last season. Avery suffered a season ending injury in the preseason in 2010 but bounced back to play eight games last year with the Titans. This off-season marks the first time that Grigson has had the reigns as a general manager in the NFL. He and his staff have been extremely busy in acquiring a total of eight players via free agency or through trade in the last two weeks. Fans: Don’t Knock The World Off Its Hinges! As a kid, I read a lot of books and listed to audio versions of them as well. You hardly ever saw me without a book or a tape player. At night, the tape player went under my pillow—and played on. In the tub, the tape player went on the ledge—and played on. In the car on road trips, the tape went into the car player—and played on. One of my favorite audio series’ was The Sugar Creek Gang, a series of books authored by Paul Hutchens in the early 40’s. Years later, Paul Ramseyer narrated the books onto cassette tapes. I listened to those tapes until they were just about worn completely out. I was also fortunate enough to be able to speak personally with Mr. Ramseyer by telephone as a young boy. I LOVED the series. As I’ve scanned the forum and the web for the past little while since the release of future Hall of Fame quarterback Peyton Manning was announced, it seemed to me that a lot of fans are doing just what Bill’s mom warned against—They’re knocking the world off its hinges! In reality, the Indianapolis Colts have many bright days ahead, and while no one should ever forget just what Peyton Manning meant to this city, we must also look on the positive side of things and see that the famed trio of pessimism, gloom, and doom do no one any good. With that in mind, here are 10 reasons not to ‘knock the world off its hinges’. Stick with your team, your players, your coaches, your Front Office, and your owner. And don’t knock the world off its hinges. *A Very Special Thanks To UndecidedFrog For His Assistance With The Salary Cap Numbers. The Indianapolis Colts will hold a press conference today, March 7, at noon at the Indiana Farm Bureau Football Center. Colts Owner & CEO Jim Irsay and quarterback Peyton Manning will both be available.